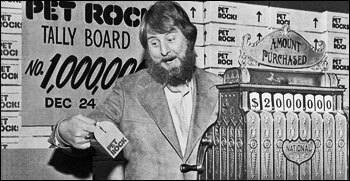 Perhaps the most ridiculous fad of all, the Pet Rock symbolized the silly hearted nature of people which allows most fads to grow. Created by Gary Dahl (pictured), the rocks were seen as a perfect pet, needing very little maintenance and always behaving, quietly and peacefully. 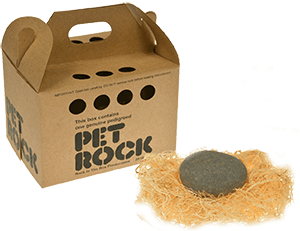 For a six month period in 1975, the rocks (which were first introduced in the San Francisco area) were given as gifts to friends and family members, packaged in boxes with a 20 page owners manual (entitled “The Care and Training of Your Pet Rock”) and often with birth certificates or papers so as to affirm pure breed lineage. The manual instructed “If, when you remove the rock from its box it appears to be excited, place it on some old newspapers. The rock will know what the paper is for and will require no further instruction. It will remain on the paper until you remove it.” The rocks debuted right before Christmas in 1975 and within months had sold more than 1.5 million. Though initially just plain rocks, they quickly were sold in a variety of looks, often with small faces painted on, often sold as a group of pebbles, symbolizing a small family all for only $3.95 (they were piece of Mexican beach stone and only cost him a penny a piece, purchased from a nearby sand and gravel company). Dahl tried a number of other creations over the years including sand breeding kits (complete with male and female sand), cubes of dirt from China (only $5.95) and authoring the book “Advertising for Dummies, 2nd edition). None of these, however, culminated in the same success he enjoyed with the Pet Rock. Gary Dahl died on March 23, 2015 and left a legacy as a marketing genius so imaginative that he could sell a rock… to everyone.